New in V2.1.5 – DLNA Renderer Support! - soundseeder.com | Play music simultaneously on multiple devices. News > SoundSeeder > New in V2.1.5 – DLNA Renderer Support! SoundSeeder v2.1.5 is out now! Control SoundSeeder remotely via DLNA controller applications. This feature brings support for several new audio sources via third party apps. In cooperation with the app AirAudio, SoundSeeder is able to stream the complete system sound of a rooted Android device to the connected speakers. 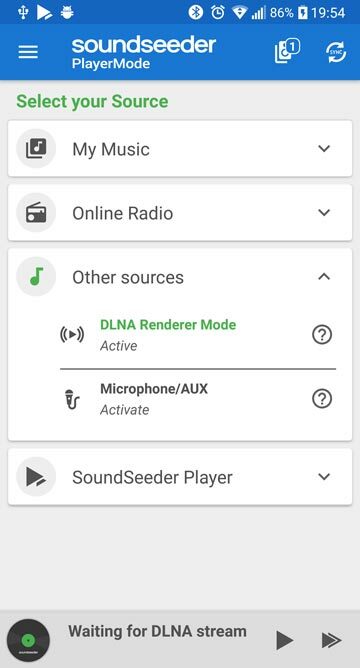 AirAudio connects to SoundSeeder with DLNA locally or via WiFi. Additionally SoundSeeder v2.1.5 brings a bunch of enhancements and bugfixes, like a new audiotrack info dialog, an improved streaming quality and even more radio stations. Get the latest version now!